Fox & Weeks was honored to present a $1000 Matthews Children’s Foundation grant to Royce Learning Center in May to assist the educational facility with the cost of continuing programming for indviduals with learning disabilities. Fox & Weeks has now awarded nearly $25,000 in Matthew’s Children’s Foundation grants since 2012. Each time a family purchases a casket at Fox & Weeks, a portion of the cost is donated to the Matthew’s Children’s Foundation in the name of the deceased and the accumulated funds are distributed quarterly through an application process to local non-profits benefiting children and children’s causes. Royce Learning Center was founded in 1970 by Harriet Royce along with a small group of other professionals and parents who were advocates for individuals with learning disabilities. Royce continues to serve those who learn differently, want to improve their academic skills, or seek to attain specific credentials or certifications for the workplace. With students ranging in age from Pre-K to 91 years of age, Royce Learning Center continues to meet the needs of children and adults with learning differences and literacy needs through its three unique programs: Chatham Academy, The Adult & Community Education (ACE) program, and The Tutoring Center. 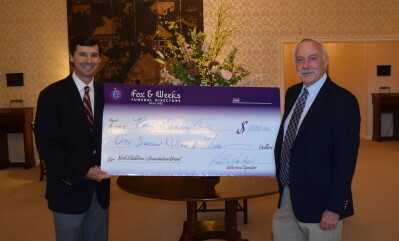 The Matthew’s Children’s Foundation is affiliated with the Mathews International Corporation casket division and has delivered millions of dollars in grants throughout the country since its introduction in the early 1990s, and Fox & Weeks is the only funeral home in the area actively participating in the Matthew’s Children’s Foundation program. The purpose of the Matthew’s Children’s Foundation is to support non-profit organizations dedicated to children, and any organization in the Coastal Empire with the primary purpose of providing for children’s needs is eligible to apply for a Matthew’s Children’s Foundation grant.